World of Wires opened with one of the most thrillingly witty displays of illusion I've ever seen on a stage or a screen — a genuine challenge to one's fixed notion of reality — and then barreled through another 90 minutes of riveting near anarchy. I'm hereby sending a brain transmission out to some Off Broadway/nonprofit Morpheus: Please, reboot this soon. 2012 OBIE AWARD FOR BEST DIRECTION!! SIMULATED CITIES / SIMULATED SYSTEMS PART 3. New play adapted and directed by Jay Schieb after the film "Welt am Draht" by Rainer Werner Fassbinder. Screenplay based on the novel “Simulacron-3” by Daniel F. Galouye. World of Wires is the final installment of writer and director Jay Scheib’s performance trilogy Simulated Cities/Simulated Systems. 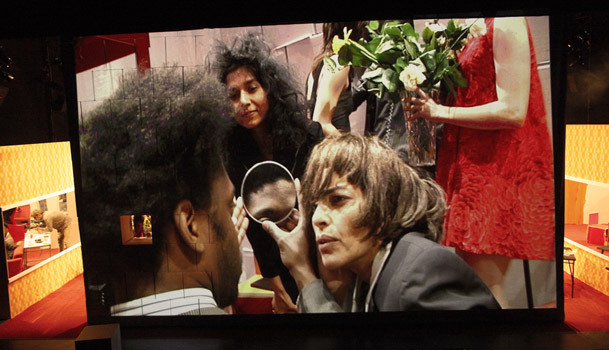 Part two, Bellona, Destroyer of Cities, also premiered at The Kitchen, followed by presentations at the Institute of Contemporary Art/Boston and at Maison des Arts Créteil in France. Part one, the Obie Award-winning Untitled Mars (this title may change), premiered at Performance Space 122 in New York City, followed by a presentation at the Hungarian National Theater in Budapest. Available for worldwide touring: May 2012. With performances by Winsome Brown, Mikéah Ernest Jennings, Rosalie Lowe, Jon Morris, Ayesha Ngaujah, Laine Rettmer and Tanya Selvaratnam Scenic design by Sara Brown, sound design by Anouschka Trocker, video design by Jay Scheib and Josh Higgason, Lighting design by Josh Higgason. When Professor Fuller, chief technical officer of Rien Incorporated, suddenly goes missing, Fred Stiller, her colleague, begins to investigate. As the investigation spirals into chaos, he discovers that he himself is part of the simulation he thought he had been hired to design, and Professor Fuller had simply been deleted. World of Wires is a performance about the unveiling of a computer simulation so powerful that it is capable of simulating the world and everything in it. This new live-cinema performance inspired by the works of Professor Nick Bostrom, Rainer Werner Fassbinder, science-fiction writer Daniel F. Galouye, and an armed robbery at a Duane Reade drugstore that Scheib himself experienced is an all-bets-are-off homage to the startling possibility that you might actually really be ones and zeroes in someone else’s immaculately programmed world. In his 2003 paper titled Are You Living in a Computer Simulation?, Bostrom, Director of the Future of Humanity Institute and Professor of Philosophy at Oxford University, theorized that there is a high probability we are currently living in a computer simulation. Years earlier, in 1973, Fassbinder made an excursion into the world of virtual reality with a science-fiction television series, Welt am Draht, which was based on Galouye’s seminal 1962 novel, Simulacron-3, precursor to films like Larry and Andy Wachowski’s The Matrix. Picking up where they left off, this production of World of Wires is a critique of both the genius and the fallibility of computer simulations—in a world which, as Baudrillard suggested, regularly casts the terms of reality into question. Development of the work has been sponsored by two residencies. The first was awarded by the Lower Manhattan Cultural Council and took place on Governors Island in New York City in July 2011. Three weeks of improvisations and compositional studies resulted in a draft of the first forty pages and a 45-minute work-in-progress presentation for an invited audience. Following the Governors Island residency, director Jay Scheib spent three weeks developing a prototype of the production with students at Massachusetts Institute of Technology in Cambridge MA where Scheib is Professor for Music and Theater Arts. Then, in October, World of Wires was presented as an open rehearsal at the PRELUDE 2011 Festival at the Segal Theater Center in New York City. Tanya Selvaratnam (Producer/Actor) is a producer, performer, writer and activist based in New York City and Cambridge, MA. She started her professional acting career as a back-up dancer for John Fleck at an ACT UP Benefit in 1993. 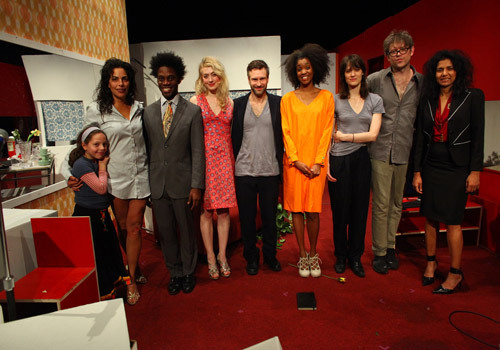 Since then, Tanya has performed around the world in shows by The Wooster Group, The Builders Association, and Jay Scheib, among many others; and has appeared in films and video installations by artists including Gabri Christa, Andrea Geyer, Sharon Hayes, John Malpede, David Michalek, Jennifer Reeves, and Carrie Mae Weems. She has been a fellow at Yaddo and Blue Mountain Center, and a guest actor at Voice & Vision Theater, Lincoln Center Directors Lab, New Dramatists, and the Institute on Arts & Civic Dialogue. Also an accomplished film producer, recent projects include Chiara Clemente’s Our City Dreams, Catherine Gund’s What’s On Your Plate?, Beginnings (an original short film series for the Sundance Channel), and MADE HERE (a performing arts documentary series for HERE). Since 2008, Tanya has served as the Communications and Special Projects Officer for the Rubell Family Collection. She received her graduate and undergraduate degrees from Harvard University. Winsome Brown (Actor) is a writer, director, and Obie-award winning performer. She most recently performed in André Gregory and Wallace Shawn’s “The Master Builder,” and in the film of the same project directed by Jonathan Demme, and “La Vie Matérielle” directed by Irina Brook. Brown is currently directing and touring the live music and film performance "The Lost Victrola Sessions" with music by Dave Soldier and her own 16 mm experimental film "The Violinist." Mikéah Ernest Jennings (Actor) has been seen in Bellona, Destroyer of Cities (ICA Boston, EXIT Festival Paris, The Kitchen); Green Eyes (Hudson Hotel); PULLMAN, WA (Chelsea Ttre, London); The Shipment (Sydney Opera House, The Kitchen, Int'l Tour); S.O.S. (The Kitchen, REDCAT, Int'l Tour); The House of No More (DTW, Int'l Tour); and A Dream Play (St. Ann’s Warehouse). Film credits include Failing Better Now, Things That Go Bump In The Night and The Record Deal. For more information, go to www.mikeahjennings.com. Rosalie Lowe (Actor) is a performer and director who moved to New York City from Portland, Oregon where she earned her BA in Literature and Theatre at Reed College. During her time in New York City she has worked at La MaMa E.T.C. and has interned with The Wooster Group. Most recent projects include The Woodshed Collective’s The Tenant as an assistant director and performer, and United Broadcasting Theater Company’s Arcane Game as a sound Foley and video operator. She has worked as an assistant director and dramaturge for Portland based theater company Hand2Mouth and has studied film acting at La Fémis in Paris with NYFA. Jon Morris (Actor) has created and performed with Fuerzabruta, Cirque du Soleil, The MET, Spymonkey, Diavolo Dance Theatre, the Evidence Room, Ken Roht’s Orphean Circus, Fabulous Monsters and Theatre de la Jeune Lune. His company, The Windmill Factory, creates original work from living performance installations to international dance theatre collaborations. Recent works were presented at Robert Wilson’s Watermill Center, La MaMa ETC, and the Burning Man Arts Festival. For more information, go to www.thewindmillfactory.com. Ayesha Ngaujah (Actor) was last seen in Tommy Smith’s The Wife and directed by May Adrales at Access Theatre in NYC. She has also performed in American Schemes by Radha Blank for Summerstage, Eclipsed at Woolly Mammoth Theater in DC, Angela's Mixtape at the Ohio Theater, Times 365:24:7 at the Bone Orchard Theatre, Van Gogh Café at Synchronicity Performance Group (ATL), Stick Fly at True Colors Theatre Company (ATL), GoDogGo! at Alliance Theater (ATL) and others. Internationally, she has performed in Diggydotcom 2.0, Made in Da Shade (Amsterdam, Netherlands), and Spring Awakening, Albatheaterhuis (Den Haag, Netherlands). Laine Rettmer (Fred and Assistant Director) graduated with honors as a trustee scholar from NYU, TISCH in 2007. Since then she has continued to work as a director, actor, and writer in NYC. Upcoming work includes: directing a reading of a new play by Benjamin Forster, acting in both Anathema- dir. Peter Bolt, as well as Charles Mee’s newest play with the theater company, Witness Relocation. Sara Brown (Scenic Designer) is a scenic designer based in Cambridge, MA. Recent projects include projection design for Island created by the DC based dance company Dana Tai Soon Burgess & Co and scenic design for A House in Bali which was featured in BAM’s Next Wave festival in 2010. Future projects include collaborations with The Sideshow Theater Company in Chicago and The Lyric Stage Company of Boston. She is the Director of Design for MIT Music and Theater Arts. Josh Higgason (Projection Design) is a designer and creator of visuals, multimedia, and interactive objects for live performance. He tours nationally and internationally with Jay Scheib, The Builder's Association, Big Dance Theater, Jim Findlay, Latitude 14, Sufjan Stevens, and Toni Dove. His work has been seen at such venues as Carnegie Hall, BAM, Theatre National de Chaillot Paris, Philly Live Arts Festival, HERE, PS 122, The Flea, Atlantic, MassMoCA, Dixon Place, EMPAC, Edinburgh Fringe Festival, Copenhagen, London, Spain and others. Joshua has also taught workshops on video design and interactive programming at the LIU New Media Art Graduate program. Anouschka Trocker (Sound Design) was born in South Tyrol/Italy. She studied Latin American and Romanistic Languages and Literature and at the FU Freie Universität Berlin. M.A. 1999. Since then she has worked with sound. She makes radio fiction, radio drama, sound installation and sound design for theater and film. Susan Wilson (Stage Manager) studied theater, literature, and computer science at Massachusetts Institute of Technology, and currently works as a freelance theater professional with emphases on directing, video design, and stage management. She is a founding member of The Coalition, an ensemble-based theater troupe in Boston. Recent productions include A House in Bali (company manager: BAM Next Wave Festival), Trad (stage manager: Tir Na Theatre Company, New England premiere), Too Much Light Makes the Baby Go Blind (director, emcee: Dramashop), and Island (stage manager, video operator: Dana Tai Soon Burgess & Co., world and U.S. premieres). Jay Scheib, a 2011 Guggenheim Fellow, is a director, designer and author of plays, operas and live art events. Internationally known for works of daring physicality, genre-defying performances and deep integration of new technologies, Scheib’s upcoming productions include World of Wires, the final installment of his science vs. fiction trilogy Simulated Cities/Simulated Systems, and a collaboration with choreographer Yin Mei and the Hong Kong Dance Company on a new ballet titled the Seven Sages, opening in Hong Kong in March. Recent productions include Bellona, Destroyer of Cities, which went to the Institute of Contemporary Art in Boston and to Maison des Arts in Creteil, France after its Kitchen run. 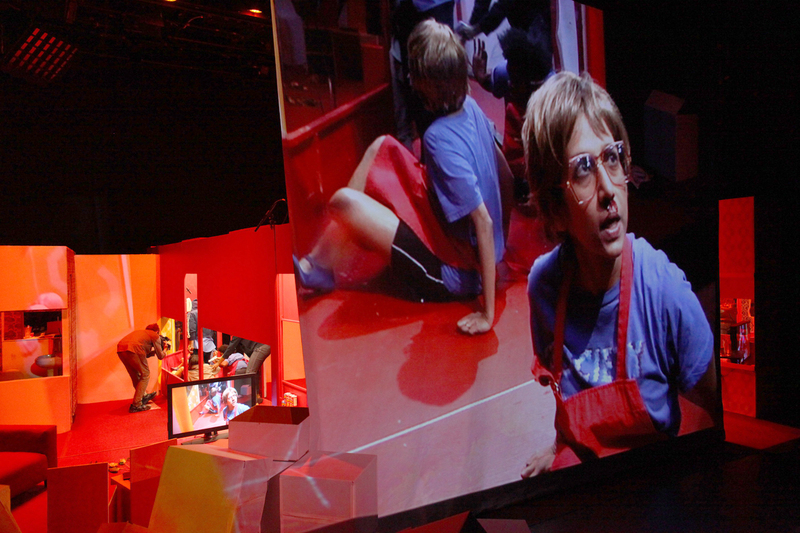 Other recent works include Evan Ziporyn’s A House in Bali, presented as part of BAM’s Next Wave Festival 2010; a new staging of Beethoven's Fidelio at the Saarländisches Staatstheater in Saarbrücken; Brecht's Puntila und sein Knecht Matti at Theater Augsburg; This Place is a Desert (ICA/Boston, Under the Radar Festival/Public Theater); and Addicted to Bad Ideas, Peter Lorre’s 20th Century, which played at Spoleto Festival, Urban Festival Helsinki, Luminato Festival Toronto, Peak Performances Montclair, Philadelphia Live Arts Festival and more. Other works include the world premiere of Irene Popovic’s opera Mozart Luster Lustik at the Sava Center, Belgrade, Serbia; Lothar Trolle's Ein Vormittag in der Freitheit at the Volksbühne am Rosa-Luxemburg-Platz, Berlin; a new staging of the Novoflot science fiction opera saga Kommander Kobayashi in Saarbruecken, Germany; and Untitled Mars (This Title May Change) at Performance Space 122 in New York and at the State Theater in Budapest, Hungary. Listed Best New York Theater Director by Time Out New York in 2009, and named by American Theater Magazine as one of the 25 theater artists who will shape the next 25 years of American theater, Scheib is a recipient of the Edgerton Award, The Richard Sherwood Award, and the NEA/TCG Program for Directors. He is a regular guest professor at the Mozarteum in Salzburg, Austria and is Professor for Music and Theater Arts at Massachusetts Institute of Technology. Jay Scheib’s world premiere of WORLD OF WIRES played a sold-out, three week engagement at The Kitchen in New York City. Garnering an array of rave and insightful reviews, interviews and preview articles World of Wires is the final installment of Jay Scheib's Simulated Cities / Simulated System performance trilogy— read David Cote's review in Time Out New York; AndrewAndrew's insta-review Papermag; Ben Brantley's review in the New York Times; Alex Zafiris' interview in BOMB; Scott Macauly's interview in Filmmaker Magazine; and Carmen García Durazo's review in Guernica among others — and the critical discussions continue—Scott Brown's write-up in New York Magazine and Ben Brantley's essay in the Arts Beat Blog on New Media in the Theater for the New York Times. Ayesha Ngaujah, Jay Scheib, Laine Rettmer, Sarita Choudhury. Full photo set of hi and low res images here! "His brand of theater always seems to be ahead of everybody else." "Visually dazzling and conceptually rich"
"In Wires, after all, the characters are at last queasily accepting of their perpetually scrambled personality crossfire. In the span of ninety minutes, they experience (and seem to learn from) love, death, searing anger, and crushing joy. Even when in their digitally fabricated forms, Scheib’s characters—much like the Second Life or, say, Facebook personalities of his audience members—express, emote, and pine. Most importantly, it seems that despite their staccato-like appearances onstage, behind mirrors, blazoned on a video screen, or projected ten feet high, they, like you, hope that they are going to be just fine." Carmen García Durazo, Posthuman at Last: Chaos and Cunning in Jay Scheib's World of Wires. "If you liked the ideas in 'The Matrix', check this drama out." The reality-undermining narrative of the novel gains another layer in this mediated live performance, showing us two versions of the same acts (one on stage, the other on screen) and thereby suggesting the possibility of countless alternate realities. If only for a moment, Scheib makes us question how hardwired into this reality we've become. For the interdisciplinary auteur Jay Scheib mixing media is as much a socio-philosophical statement as an aesthetic one. His “World of Wires,” seen this month at the Kitchen in New York, follows the descent of one brave computer techie into an alternative, digitally simulated universe. Based on a 1973 television series by Rainer Werner Fassbinder, “World of Wires” shares the high-tech political paranoia of more recent films like “The Matrix.” It seems to ask, with equal measures of wonder and anxiety (and, thank heaven, a sense of humor) that favorite collegiate question “What if the reality we’re living in has been created by somebody else?” Mr. Scheib was his own cameraman for this production, trailing his actors and turning them into on-screen simulacra before our eyes. The show pulled off some nifty trompe l’oeil effects. But its most startling and convincing moments — like the collapse of a wall into the laps of audience members — were not cinematic but purely theatrical. The Kitchen's presentation of World of Wires is made possible with public funds from the New York City Department of Cultural Affairs and the New York State Council on the Arts, a state agency. Additional support provided by the Guggenheim Fellowship, Massachusetts Institute of Technology School of Humanities, Arts and Social Sciences, New York State Council on the Arts Individual Artist Theater Commissioning Program, the Greenwall Foundation, MIT Council for the Arts, a residency at the Clemente Soto Vélez Cultural and Educational Center, and the Südtiroler Künstlerförderung. World of Wires was supported by a Lower Manhattan Cultural Council residency at Building 110: LMCC's Arts Center at Governors Island. We greatly appreciate the support of all the individuals and institutions listed above. Donors are listed in alphabetical order and not separated by amounts. Please consider contributing to the productions of Jay Scheib. Your name will be added to the list above or you may choose to remain anonymous. In rehearsal for World of Wires Adapted and Directed by Jay Scheib after the film by Fassbinder.